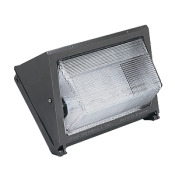 Our commercial metal halide wall pack light can be used for every type commercial building. Available in metal halide or high pressure sodium we have a light for you. 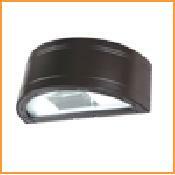 Side mount or soffit mount any application can be handled with ease. We carry a small,medium and large case metal halide wall pack to handle any wattage your application calls for. Each wall pack comes complete with lamp, multitap ballast (120-240-208-277 volt) and a heat resistant shatter proof glass lens. Easily adaptable to a photo control sensor.